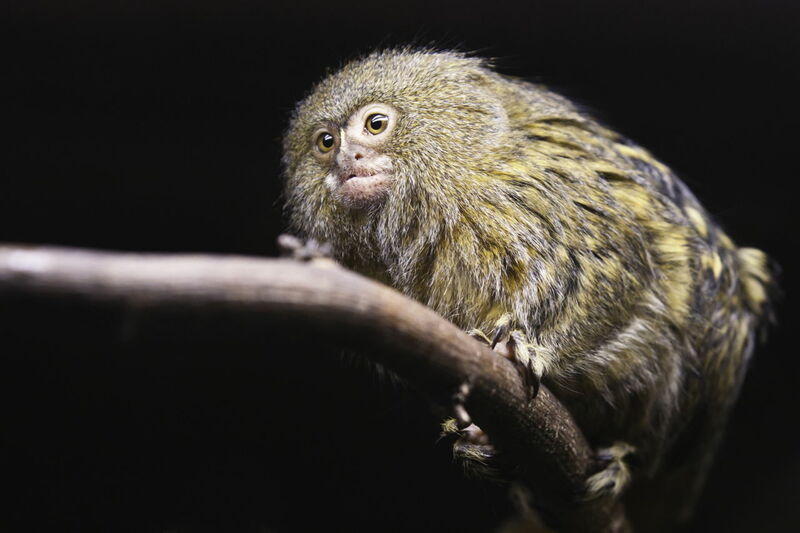 Pygmy marmoset, with an average body length of 5.5-6.3 inches, is the smallest monkey in the world, while the Mandrill, with an average length of 30-37 inches, is the largest. In between the two, there exist hundreds of species which are broadly categorized into two types - New World and Old World monkeys. Monkeys are classified into two groups; the 'New World monkeys', i.e. 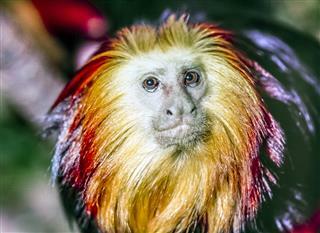 the species found in South and Central America, and the 'Old World monkeys', i.e. the species from Asia and Africa. Other than their range, there exist quite a few differences between the two. While the New World monkeys have tails which they use efficiently, Old World monkeys don't usually have one, and even if they do they don't use it like their New World counterparts. The Old World monkeys have versatile thumbs, and these thumbs compensate for the absence of tail. 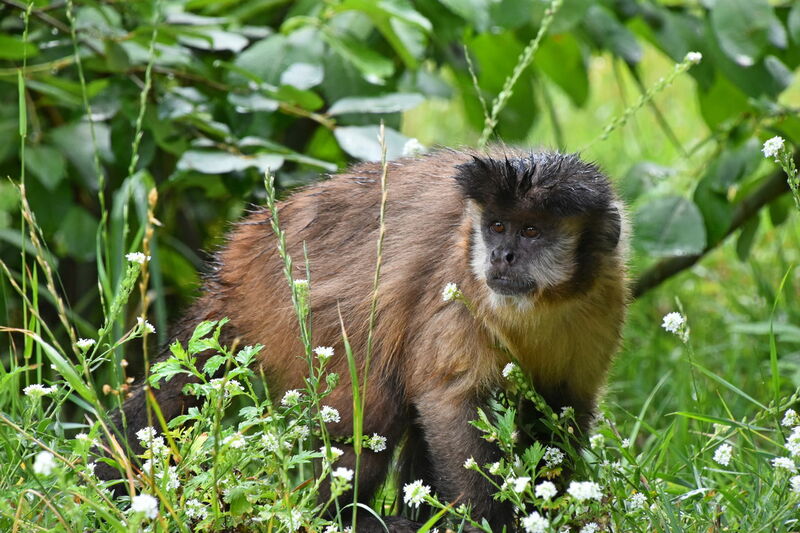 The list of New World monkeys includes species like marmosets, tamarins, capuchins, squirrel monkeys, owl monkeys, howler monkeys, spider monkeys, woolly monkeys, etc. On the other hand, the list of Old World monkeys includes species like macaques, baboons, colobus, langurs, mandrills, mangabeys, etc. Marmosets (species of Callithrix, Cebuella, Callibella, and Mico) are the smallest monkeys and live in the upper canopy of trees. Marmosets are just 5 inches tall and are highly active. They are mostly found in Colombia, Ecuador, Bolivia, Peru and Brazil. They feed on insects, fruits and leaves. Long lower incisors enable marmosets to chew the tree trunks and branches and extract gum. For communication, they whistle or make high-pitched noises that are inaudible to humans. 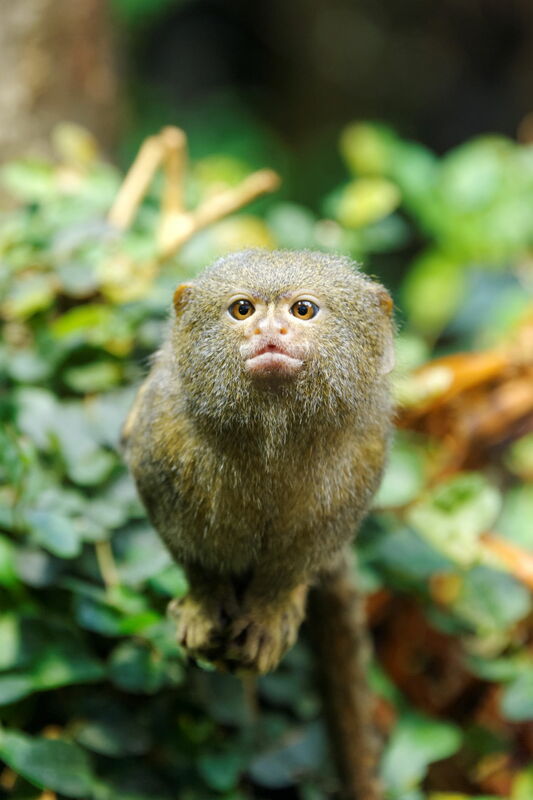 Don't go by its size as the male marmosets are strong enough to fight and save its dominion from the enemies. 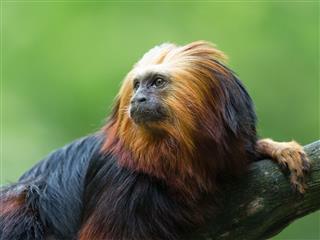 Tamarins (genus Saguinus) are the inhabitants of the tropical rainforests, mainly found in Brazil. They can be differentiated because their body color usually ranges from shades of black, brown, white and bright orange. The Tamarins with brown and white fur are "emperor tamarins" and ones with bright orange fur are called "golden lion tamarins". 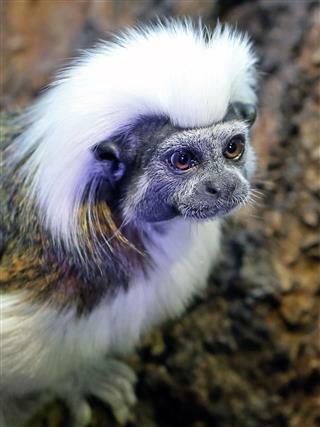 The tamarin's lower canine teeth are longer than the incisors. They are omnivorous. Their body size ranges from 13 to 30 cm and in captivity, they can live up to 18 years. 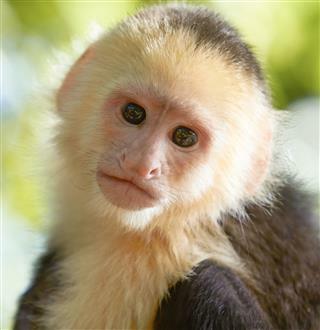 Capuchins (genus Cebus) are not so temperamental and can be kept as pets. They belong to a few category of monkeys that are good as pets. They are cute-looking monkeys with white- or pink-colored face. These are commonly found in Central and South America. They grow up to 56 cm with average length tails. They are brown, black or white in color. They are omnivores and can eat insects, birds' eggs, crabs and fruits. Squirrel monkeys (genus Saimiri) are mostly found in Central and South American forests. They are 25 to 35 cm tall and live in the canopy layer of the trees. They have short and close fur. Their backs and extremities are yellowish orange, whereas the shoulders are olive-colored. 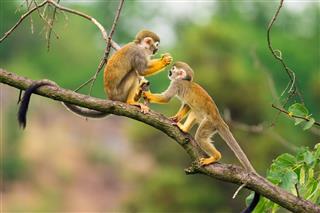 Squirrel monkeys have black and white face. They have hair on the upper side of the head. These monkeys are timid and silent. They are always found in large groups comprising 100-300 individuals. Being omnivores they primarily feed on fruits and insects, while occasionally eating nuts, eggs, seeds, leaves, flowers, etc. Sakis (genus Pithecia) are monkeys with a beard. Their body is full of fur except the face, which has a furry cover around it. Saki males are black with a pale face, whereas the females have gray-brown fur with white-tipped hair. Saki monkeys live in rainforests. They are active during daylight. These monkeys are omnivores like many other monkeys. They grow up to 20 inches in length. They are small in size and have a bushy tail. Saki monkeys are not so temperamental and are shy in nature. About 90% of their diet comprises only fruits, balanced by a small proportion of insects, leaves and flowers. Largest among the New World primates, howler monkeys (genus Alouatta monotypic) have round, wide-set nostrils and short snouts. Howler monkeys are inhabitants of South and Central American forests. They can be called the laziest monkeys because, they rarely leave their dwellings and can sleep for 15 hours at a stretch. Their howling can be heard up to 3 to 4 miles and are termed as the world's loudest animal. The howling is supposedly related to territory protection and guarding their mate. They feed on fruits and leaves. There are also known to bust into the nests of birds and eat the eggs. Spider monkeys (genus Ateles) are well-known for their jungle acrobats. They are native to tropical forests of South and Central America and are one of the few species of monkeys that are endangered species. They have long limbs that are out of proportion along with prehensile tails, making them one of the largest among the New World primates. They are brown and black in color with a long tail. These monkeys have a diet consisting of fruits, flowers and leaves. The female, generally, hunts for food, but if she can't get sufficient amount, then the group splits into smaller sections that spread out to hunt for more. Spider monkeys have this strange habit of gathering and sleeping in a group at night. They are aggressive and shout like howler monkeys. 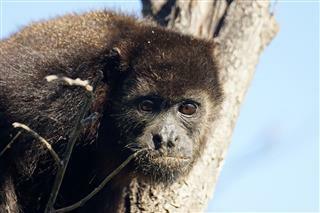 Woolly monkeys (genus Lagothrix) are inhabitants of North-West South America. These monkeys are black and gray in color with thick and soft fur. It is their thick fur that gave them the name "woolly". On an average, they weigh 17.7 kg. Their diets mainly consists of fruits, in addition to seeds, flowers, insects, etc. These are omnivores and move in large groups like most of the primate breeds. 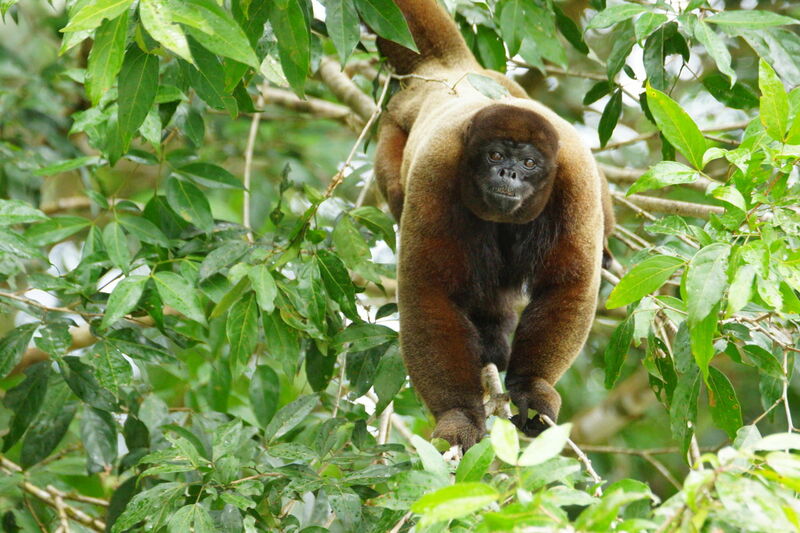 Woolly monkeys have long tails that aid them in gripping the branches. These monkeys are hunted for fur and food due to which their population has declined and are now termed as an "endangered species". Owl monkeys (genus Aotus) are also known as night monkeys and are inhabitants of Central and South America. 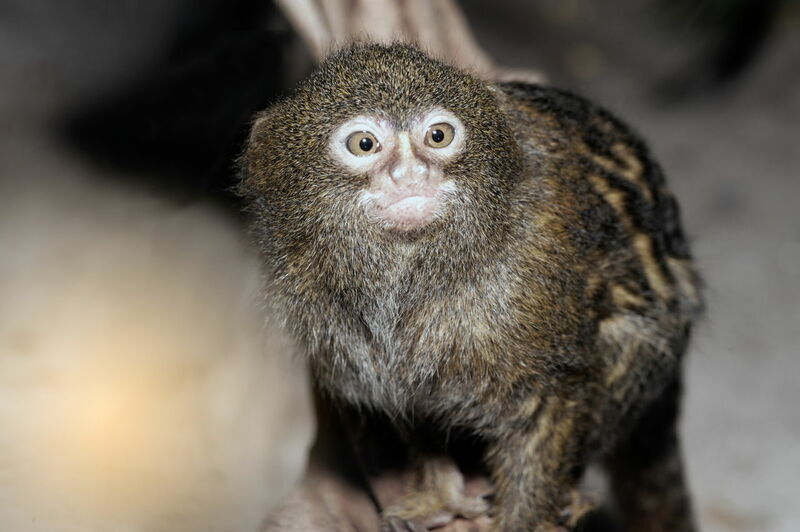 Owl monkeys being nocturnal have no color vision. They are average in size with a long tail and thick fur. Males and females show a strong affinity to each other and hence, form pair bonds and live in groups. They guard their territory by vocal noises and scent markings. Owl monkeys look like owls and have big brown eyes just like owls, that aid them to see at night. These monkeys make wide variety of sounds like hoots, trills and grunts to communicate. This is the only species of monkey that are affected by the human disease - malaria. Titi monkey (genus Callicebus) is a new species of monkey, which has been recently discovered in the Amazon Basin. These monkeys are 23-46 cm in length with a long tail. These monkeys are also known as "jumping monkeys" as they are spectacular jumpers. They feed on fruits, insects, flowers, and birds' eggs. They make "purr" like sounds just like cats to communicate. Baboons (genus Papio) have long dog-like muzzles and close-set eyes. They have thick fur all over the body except on their muzzle. Their jaws are heavy and powerful. These are basically terrestrial, dwelling mostly in open Savannah, woodlands and hills across Africa. 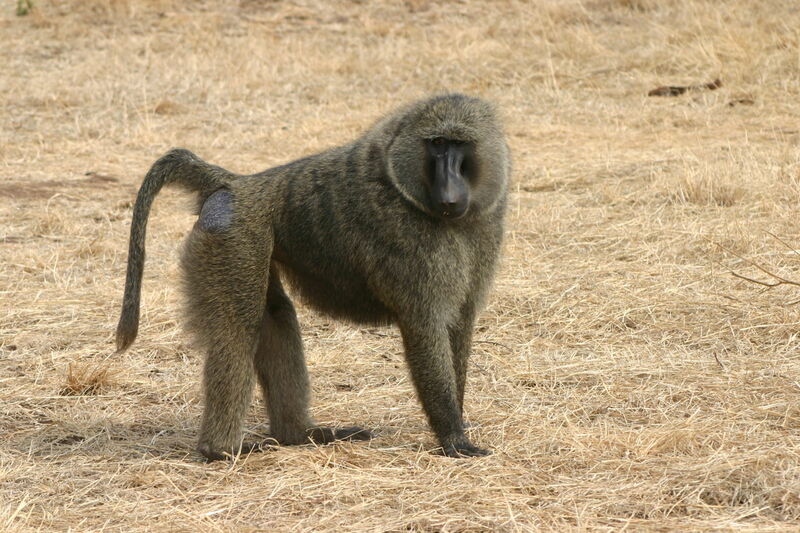 The prominent type of baboons are "Hamadryas baboons". As per Egyptian mythology, baboons are considered to be sacred animals. Most of them are vegetarians; however, some eat insects. So, they can be called omnivores. Their size and weight depend on the species. The smallest species weighs 14 kg and is 50 cm in size, while the largest is 120 cm and weighs 40 kg. 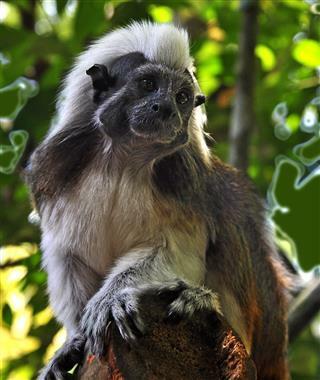 Colubuses (genus Colobus) are inhabitants of Africa. They are light-weighted monkeys, with long limbs that aid them to plunge from one branch to another. They have long shoulder hair that acts like a parachute while plunging down from trees. Their diet comprises flowers, fruits and leaves. Unlike other monkeys, Colobuses are shy and a bit reserved by nature. Most of them are white in color while some are brown. Due to the deforestation taking place in tropical areas in Africa, the survival of this species has been threatened. Langurs (genus Semnopithecus) are basically inhabitants of Asia, and are commonly found in the Indian subcontinent. These belong to a group of old monkeys. In them, the size varies with species. They are mostly gray in color, while a few are yellowish in color, with a black face and hands. This is one such monkey, which is adapted to all kinds of seasons and places. Apart from forests, they can also be found in human settlements like poles, rooftops and outside temples. Langurs are familiar to humans and are harmless. These monkeys are herbivores. This is the most commonly found monkey (genus Homo) and can be easily spotted from Japan to Afghanistan. Rhesus macaques or rhesus monkeys are inhabitants of Asia and Northern Africa. They have black, brown or gray fur. Macaques are monkeys without tail, due to which they are called "apes". These monkeys are often found in zoos, research centers and in homes, as pets. They are used extensively by humans for animal testing. Macaques are social by nature, but being "carriers of herpes B virus" they are not suitable as pets, because the virus is not harmful to them, but deadly to humans. Mandrill (Mandrillus sphinx) is closer to baboons, but more than baboons it is closer to drills, a type of monkey. Among all the monkeys, they are the most colorful ones. They have olive-colored fur and a face with blue and red color marks. They are the largest species of monkeys in the world. 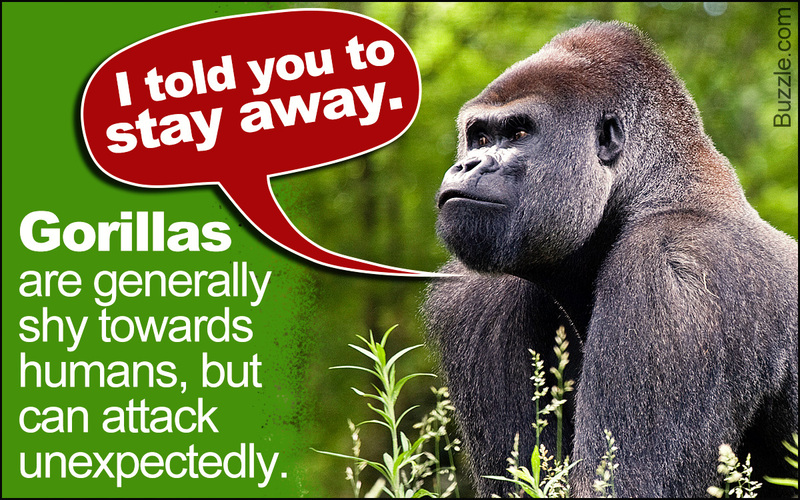 They are a native of equatorial forests in Africa. Mandrills are omnivores and have built-in sacs in which they store snacks for future consumption. Their size can range up to 6 feet relative to the size of humans. Depending on the physical features, mangabeys are classified into three categories, viz. white-eyelid mangabeys (genus Lophocebus), highland mangabeys (genus Rungwecebus) and crested mangabeys (genus Cercocebus). Earlier Cercocebus and Lophocebus were considered the same; but now it's clear that, the former and latter are related to mandrills and baboons, respectively. These monkeys are inhabitants of Africa. They are black, dark brown, golden brown and gray in color. They are quite large in size with long tails. They generally move in groups. Among all the monkeys, mangabeys are the rarest species to be found. They have a distinct way to communicate; they often grunt or make noises. There is another category - Apes, which are not monkeys but are Simians. Apes include Gibbons or the 'Lesser Apes' which has 13 species and 'Greater Apes' that include orangutan, gorillas, chimpanzees, bonobos (pygmy chimpanzees) and humans. Apart from the species mentioned above, there are many other varieties of monkeys in the world. There is lot more to these funny and intelligent mammals, than what is perceived. Undoubtedly, it can be said that these are one of the most interesting mammals on earth.